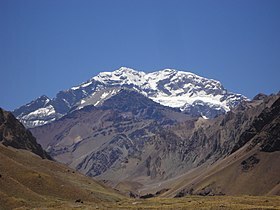 Aconcagua (Spaingie pronunciation: [akoŋˈkaɣwa]) is the heichest moontain ootside o Asie, at 6,960.8 metres (22,837 ft), an bi extension the heichest pynt in the Soothren Hemisphere. ↑ "Thare is no definitive pruif that the auncient Incas actually climbed tae the summit o the White Sentinel [Aconcagua], but thare is considerable evidence that thay did climb very heich on the moontain. Signs o Inca ascents hae been foond on summits throuoot the Andes, thus far the heichest atop Llullaillaco, a 6,721-metre (22,051 ft) moontain astride the Chilean-Argentine border in the Atacama region. 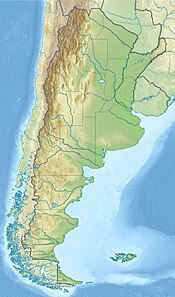 On Aconcagua, the skelet o a guanaco wis found in 1947 alang the ridge connectin the North Summit wi the South Summit. It seems doubtful that a guanaco would climb that heich on the moontain on his ain. Furthermore, an Inca mummy haes been foond at 5400 m on the sooth wast ridge o Aconcagua, near Cerro Piramidal" R. J. Secor, Aconcagua: A Climbing Guide, The Mountaineers, 1994, ISBN 0-89886-406-2, p. 13. This page wis last eeditit on 5 Mairch 2018, at 07:26.